Gotham Gazette has become the destination for some of City’s best political news coverage. I love that it doesn’t balk at running 3000-word articles on education policy, or exhaustive reviews of Scott Stringer’s first year as Comptroller. That’s why it felt like an appropriate outlet for the first Janos.nyc story, about the context our City’s history of race relations provides for the recent #BlackLivesMatter protests. You can read the piece here or below. In New York City’s black community, those origins are rooted in nearly 400 years of distrust and mistreatment. From slavery to Jim Crow, from unchecked white mobs to oppressive white police forces, the black experience in New York has been marked by pain, destruction, and neglect. There is no question that many in power have made an effort in recent decades to correct the wrongs of the past. But examining our history has to be part of the healing. Doing so will reveal that the recent protests are not just about Eric Garner, and not even just about policing. They are indeed about whether black lives matter in New York City. Although the Dutch practiced slavery in New Amsterdam, the British assumption of New York in 1664 commenced a crueler period of slaves’ treatment. One night in 1712, two dozen slaves revolted, torching houses and killing owners. The rebels were killed or captured, with those in the latter group suffering torturous executions – slowly burned alive, dragged through town by a horse, mutilated on “the wheel,” and suspended by chains until death by dehydration – their heads left on stakes for weeks afterwards. In the aftermath of that rebellion, harsh new slavery provisions were passed, and even free blacks lost the right to own land. These conditions worsened already tenuous race relations, leading to the 1741 slave conspiracy: part uprising and part witch trials for black people. After a white servant attributed an outbreak of arson around the city to a mass slave uprising, dozens of slaves were tortured into “confessing” the involvement of others before being deported, burned at the stake or hung. The historical record is ambiguous – it is possible that some slaves were plotting with abolitionist whites, but the trials were not serious inquiries. Every lawyer in town was enlisted in the prosecution. Only when prominent whites began accusing each other did New Yorkers realize the charade had gone too far. The Civil War draft riots are considered by local historians to be the absolute low point in New York City’s history. Politicians and business leaders steeped in racism and cotton trade interests were already stirring up anti-black hysteria – Mayor Fernando Wood had proposed seceding from the Union – when an 1863 federal conscription requirement ignited a fury among the city’s Irish. Nor did the Civil War’s conclusion bring racial justice to New York City. Tammany Hall, a political machine fueled by Irish and Italian votes and commensurate patronage, enforced the worst of Jim Crow Laws during its decades of dominance. Several of the worst incidents are spelled out in Jonathan Gill’s excellent book, Harlem. In 1917, not far from Ferguson, Missouri, East St. Louis and other cities were ripped apart by a mass lynching that left hundreds of black people dead and thousands homeless. Harlem’s NAACP chapter, which had been organized only recently by W.E.B. Du Bois, organized the Silent Protest Parade down Fifth Avenue, with hundreds of women and children in white leading thousands of men in black who held a banner reading, “Bring Democracy to America Before You Take it To Europe” – a sign the police took as provocation, attempting to break up the protest. In 1967, El Barrio was overrun by what Mayor Lindsay inartfully called “a disturbance” after the police shot a young Puerto Rican named Renaldo Rodriguez. Four people were killed and over a hundred were injured in the chaos. It is surprising how many transplants to New York are completely unfamiliar with the story of Amadou Diallo, a young Guinean immigrant. Four white officers from the Street Crimes Unit (3% of which was black) fired 41 shots at Diallo as he stood outside of his Bronx building vestibule, reaching for his wallet to show his identification. When the police officers were acquitted by an Albany jury (the New York Supreme Court Appellate Division had held that the officers could not receive a fair trial in the Bronx) and assigned to desk duty, organizers took to the streets with major, peaceful demonstrations. The marches, noted for their interracial composition, lasted for weeks, with activists making very similar policy demands to those being made in the aftermath of Eric Garner’s death and the Staten Island grand jury’s non-indictment. In 1999, Reverend Al Sharpton and PBA President Patrick Lynch were both players, obviously with opposing bullhorns. The Coalition Against Police Brutality, which had formed a few years earlier after a different set of policing incidents, drove many of the protests, and its lawsuit,Daniels v. City of New York, led to the disbanding of the Street Crimes Unit and the release of police arrest data. The stop-and-frisk data released after Daniels served as the basis of Floyd v. City of New York, the landmark lawsuit against stop-and-frisk that concluded in the plaintiffs’ favor this year when Mayor de Blasio declined to pursue an appeal and agreed to reform certain police procedures. The Coalition Against Police Brutality was a precursor to Communities United for Police Reform, which is now responsible for many of the “#BlackLivesMatter” actions. Thus, in some respects, today’s protests are part of an ongoing 20-year movement. William Faulkner once wrote, “The past is never dead. 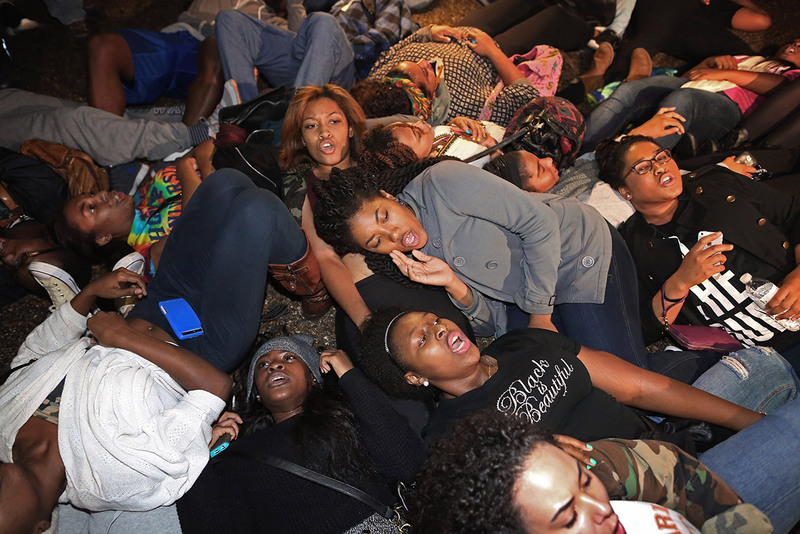 It’s not even past.” The young minority organizers of the Black Lives Matter protests say that the ongoing demonstrations are not only about Michael Brown, Eric Garner, and Akai Gurley, but about expressing the emotions of a community that has always been discriminated against. Today’s activists respond to demands that they “respect the rule of law” by asking for whom laws are designed, and for whom they are enforced. Politicians who unconditionally back the NYPD or call for “law and order” fail to acknowledge that for some communities, the rule of law has been seen and felt as a weapon and not a shield for centuries. Even today, racial disparities in the criminal justice system amplify this legacy. Changing that perception and that reality will take time. Much about police and minority community relations is slowly improving. The NYPD is more diverse than it has ever been, as the tragic deaths of Officers Wenjiang Liu and Rafael Ramos illustrate. However, as recently as 1980 the force was 90% white, which is reflected in today’s command and union leadership. The crowds marching in the street are diverse in race, age, and income and have broad support for their demands. Protesters and police officers are not hurting each other or physical property in bloody street clashes; in fact, with the exception of a few fringe protesters and fringe officers, these have been perhaps the most respectful demonstrations in recent city memory, a dynamic that inflammatory comments by the PBA’s Lynch risk jeopardizing. Yet despite these positive steps forward, we are still not a city of racial trust, let alone peace and harmony. For those who can envision a unified city, and want to put in the work, perhaps the first step is to admit that the past is real, and as long as we share these streets, it’s not even past. Perhaps a Truth and Reconciliation Process could move New York City forward. Janos Marton is an attorney, writer and activist. In January 2015 he will launch janos.nyc, a site that will revisit New York City’s history to contextualize current events. For people looking for a readable history of the city, Janos recommends The Epic of New York City by Edward Robb Ellis. Edward Robb Ellis, The Epic of New York City. Graham Russell Hodges, Roots & Branch: African-Americans in New York & East Jersey. Eric Homberger, The Historical Atlas of New York City. James Lardner and Thomas Repetto, NYPD: A City and Its People.